What's Wrong With Carriage Rides? What could be more romantic than a leisurely carriage ride on a warm summer evening? In the late 1980s, Whitey, a nine-year-old gelding, collapsed while pulling a carriage during a summer heat wave in New York City. A passing nurse gave Whitey an IV saline solution, and sympathetic police officers sprayed him with cool water for two hours. Eventually Whitey managed to get back on his feet. Another carriage horse, Misty, died from apparent heat exhaustion during the same heat wave. Despite the national attention that was focused on the carriage horse industry after Whitey's collapse--and the outrage of romantics everywhere--little has changed for the horses. Many horses who end up pulling carriages through city streets are "breakdowns" from harness racing tracks. Standardbreds are often trained to race by being tethered to the back of a truck that drives increasingly faster, so carriage horse operators consider these horses "street savvy." But standardbreds are much smaller and lighter than traditional "draft horses" and are not accustomed to pulling heavy loads. Many other carriage horses are breakdowns from Amish farming communities. Regardless of their source, most horses, as veterinarian Holly Cheever points out, "enter the carriage horse trade with a legacy of previous injuries and debility." When horses can no longer pull heavy carriages, they are sold to rendering plants or dog food companies. Even for healthy horses, a carriage ride is not an easy trip. Most cities have only minimal regulations governing working conditions for carriage horses, and these regulations are rarely enforced. Carriage horse operators know all the loopholes in their city's laws. An officer with the Canadian SPCA has said, "[I]f regulations state that a horse can work for nine consecutive hours, but [fail] to say within a 24-hour period, [drivers will] work the horse for nine hours, give the horse an hour or two of rest, then come back on the road." As a result, many horses work 12 or more hours a day, often in extreme weather conditions. As in the case of Misty, weather conditions sometimes prove fatal for working horses. Carriage horses are exposed to bitter cold and scorching heat. Carriage Operators of North America, a trade organization to which only a small percentage of carriage horse operators belong, says horses may work if the temperature is nine degrees Fahrenheit, well below freezing. In summer months, horses suffering from dehydration or heat stress can die in just a few hours. Some cities outlaw carriage rides when the temperature reaches a certain degree, but often the official weather bureau reading does not accurately reflect the temperature on the streets. A study published by Cornell University, for example, found that the air temperature recorded by the weather bureau can be nearly 50 degrees cooler than the actual asphalt temperature. And the New York City Department of Transportation found that asphalt surfaces can reach 200 degrees Fahrenheit. Horses and heavy city traffic can also be a deadly mix. Despite carriage horse operators' claims, most horses are not comfortable working among cars and trucks, and many accidents, injuries, and even deaths--to horses and humans--have been caused by horses becoming "spooked" in traffic. According to Cheever, it is normal for horses to "react to threatening situations with panic and flight." A survey of national carriage horse accidents revealed that 85 percent of all accidents were the result of an animal spooking. Seventy percent of the time there was a human injury, and 22 percent of the time there was a human death. The survey also found that in New York City, which has the highest carriage horse accident rate in the country, 98 percent of the horses who "spooked" became injured. 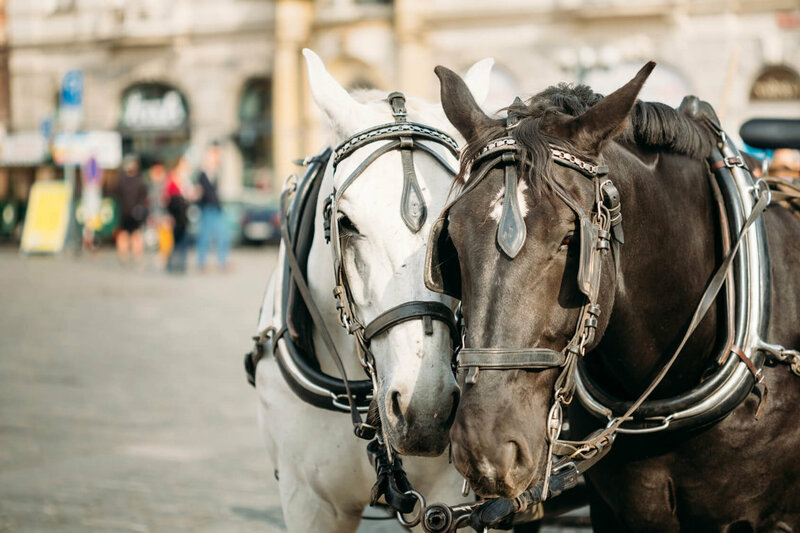 Injuries and fatalities resulting from collisions between cars and carriage horses have occurred in almost every city that allows carriage rides, including Cincinnati, Ohio; Salt Lake City, Utah; Charleston, South Carolina; Denver, Colorado; Baltimore, Maryland; and Houston, Texas. The smoke and exhaust fumes from urban traffic are also dangerous for horses. In a study by veterinarian Jeffie Roszel, "tracheal washes and samples from respiratory secretions of these horses showed enormous lung damage, the same kind of damage you would expect from a heavy smoker." Horses' nostrils are usually only 3 to 3 1/2 feet above street level, so these animals are "truly ... living a nose-to-tailpipe existence." Carriage horses also routinely suffer at the hands of poorly trained drivers. Because they are constantly walking and standing on hard streets, "lameness and hoof deterioration are inevitable" in carriage horses, says Cheever. "The problems are worsened by the inexperience of the gross majority of the owners and drivers, who are either incapable of recognizing lameness or are unwilling to suffer financial loss by removing a horse from service for a few days." Many drivers don't know how to fasten harnesses correctly, and either leave straps so loose they rub and chafe the horse's skin, or buckle the straps so tightly they pinch. And few horses are fitted with new horseshoes as often as is needed. Conditions for carriage horses aren't much better when the horses are off the streets. Raids on carriage horse stables have exposed stalls with no hay or other bedding, stall floors covered with urine and manure, poor ventilation in the stables, and horses who had no free access to water. Many stables have stacked floors--like parking garages--with steep ramps leading from one floor to the next. The floors in one stable were so rotten, they often gave way under the weight of the horses, repeatedly causing animals to break their legs. In 1991, two horses owned by a carriage horse operator in New York died after being fed bad hay. Not surprisingly, carriage horse operators view attempts to regulate their industry--through stipulations on where and how long horses can work, temperature restrictions, and mandatory veterinary care--as economic threats. One carriage horse operator in Charleston, S.C., even said,"[L]egislation is ridiculous." In her classic novel, Black Beauty, Anna Sewell wrote, "My doctrine is this, that if we see cruelty or wrong that we have the power to stop, and do nothing, we make ourselves sharers in the guilt." People around the world agree and are increasingly recognizing that it's the carriage horse industry--not just the horses--who are taking them for a ride. Don't patronize the carriage horse industry. Educate others about carriage horses. Pressure from concerned residents has resulted in bans on carriage horses in a growing number of cities. Educate your local officials on the issue.